Tim started harvesting his mason bee cocoons from his wooden trays last week using our fabulous SCOOP. He emailed me this photo showing a very good harvest. 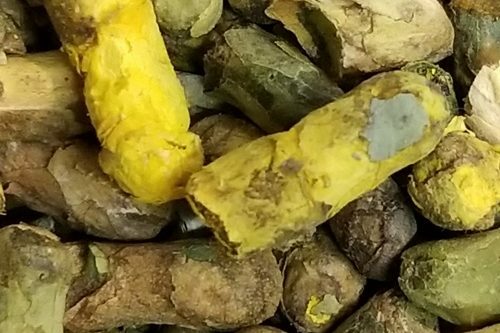 60 cocoons in just one layer. 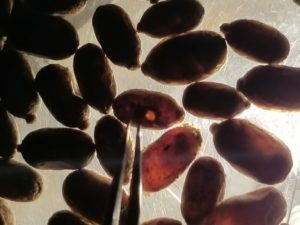 See what your harvest looks like per female cocoon. And see what your mite infestation is to tell you how well you removed mites from cocoons before setting them out in the spring. In spring before setting cocoons out, count the number of total cocoons. This will help in calculating if your harvest is a good one. Each female produced 1540/300 or 5 offspring. Nothing wrong with this production. If the percentage of mite infested cells is less than about 5%. You have done a good job of cleaning mites of cocoons and nests. These photos below clearly show what is a ‘good’ cocoon and a cocoon that needs to be discarded. 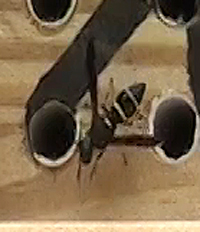 In one cocoon a bee is clearly outlined showing its feet and mouth parts. The next photo is empty with the remains of a dead larvae. These are discarded. 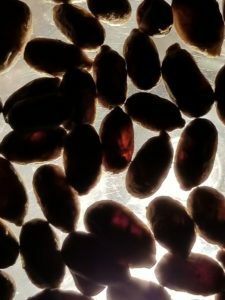 (You may want to have a closer look at what is inside these cocoons). 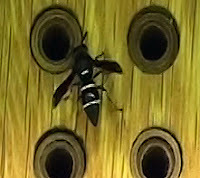 The most common parasitic wasp species have about 10 little wasps per cocoon. 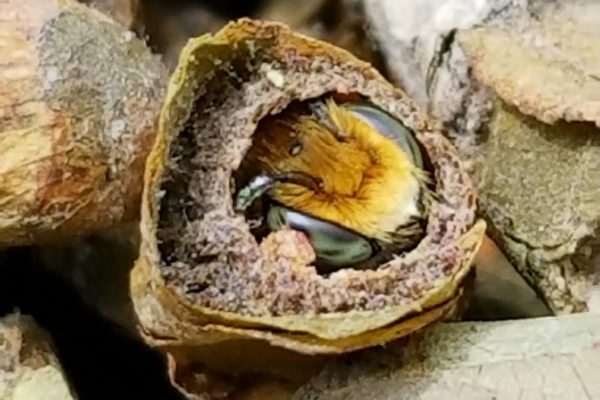 A cocoon filled with a healthy mason bee. 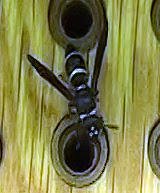 Mouthparts and the forelegs are clearly visible. Set up candling set up, and turn lights off in teh room. 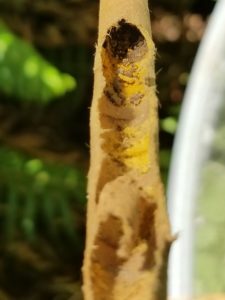 A cocoon with a parasitic wasp exit hole. Remove this one! This cocoon contains developing parasitic wasps. 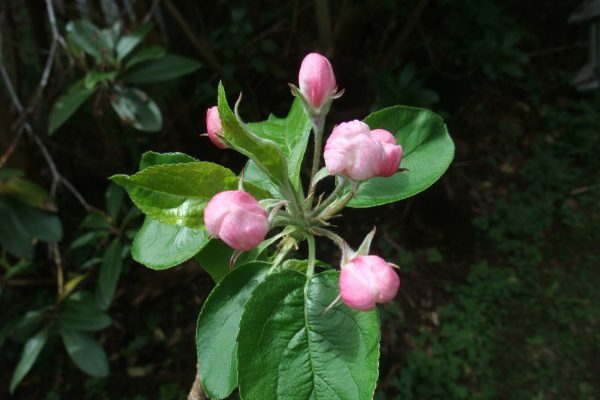 What is going on in our garden during August? In late July and August, the garden beckons us like no other time. Harvesting and cleaning and watering are just some of the daily tasks that ensure the garden is in good condition not only for this season, but next year. 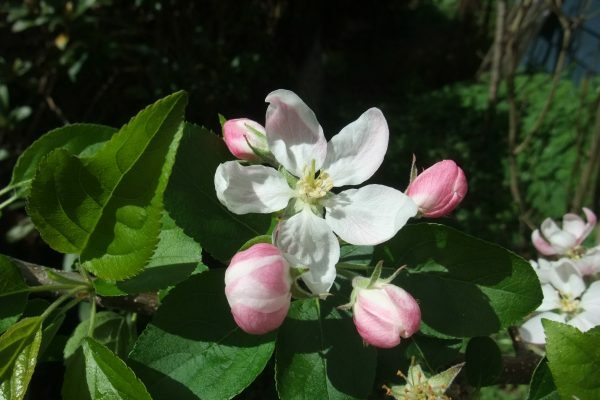 These tasks all come into focus when I receive my copy of Pome News a quarterly newsletter from the Oregon Orchard Society. Reminders of what to do are invaluable since quite a few of these tasks are forgotten or not completed. What I was most surprised about was the adding of fertilizer, like kelp, alfalfa meal or canola meal to ground covers. 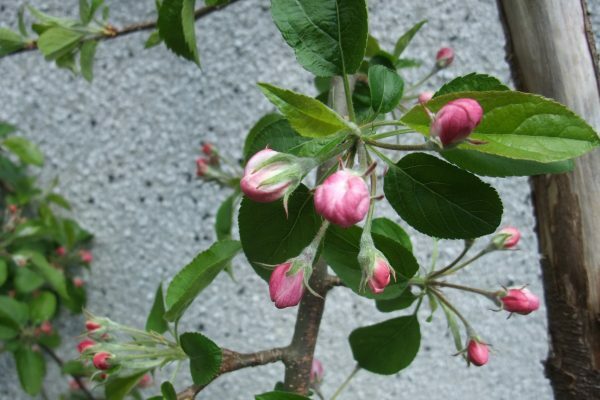 I have always thought of adding the fertilizer in the spring, but now I realize that maintaining plants and soil is a year-round task. 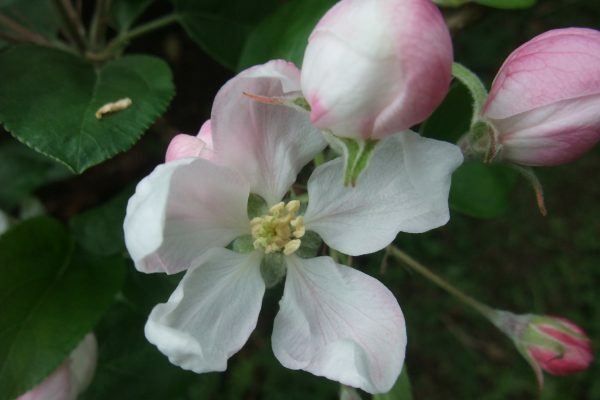 Other general tasks include pruning flowering shrubs like azaleas and rhododendrons if needed. In the front of the house this one bramble has seemingly taken over part of the yard. I clipped it back so we could access the front yard. This summer, temperatures have been hot and the wild rose has been going berserk. One plant near the front steps was totally unruly and was thinking of taking over the front door. This rose does very well over an arbor, but space is limited now with other plants taking over the space. 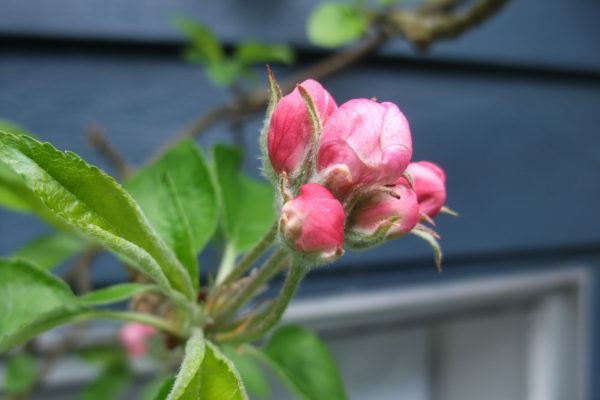 As I am cruising the front yard, I looked for a forgotten Saskatoon berry bush. 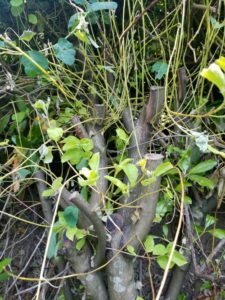 I find it totally overgrown by vigorous Red Osier dogwood plant. No wonder I could not see it. The poor Saskatoon bush , it tried to produce a multitude of very thin branches, but leaves need the sun. 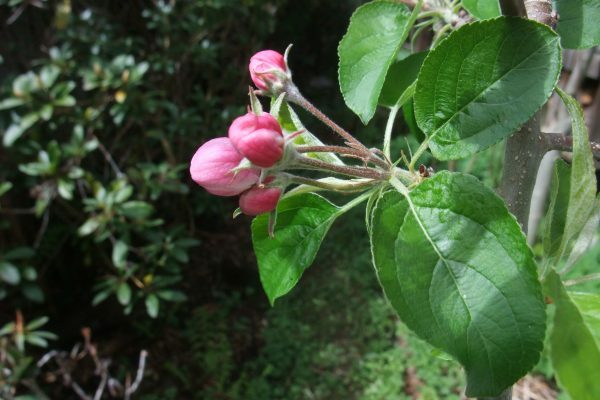 The birds love this fruit, as I do, so I hope it will again blossom for us next spring. Part of all this is to cruise around your garden to see what needs doing. 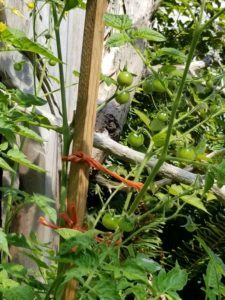 For example, staking tomatoes is not something you do once a week or so, but gets done when it needs to be done. 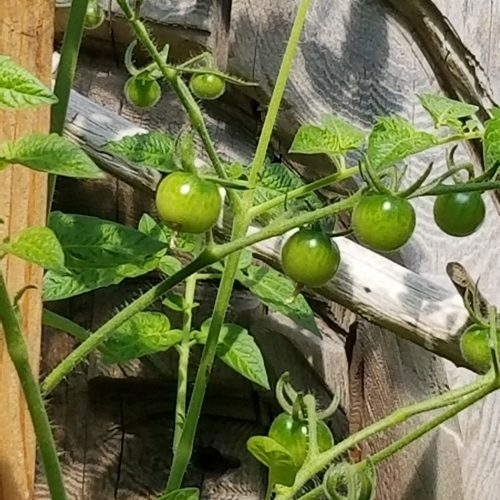 I saw a bumble bee flitting among the cherry tomato flowers today. Hoping for a good crop this year. It was Bombus mixtus– a mostly yellow bee with a very small area of orange on its ‘tail’. 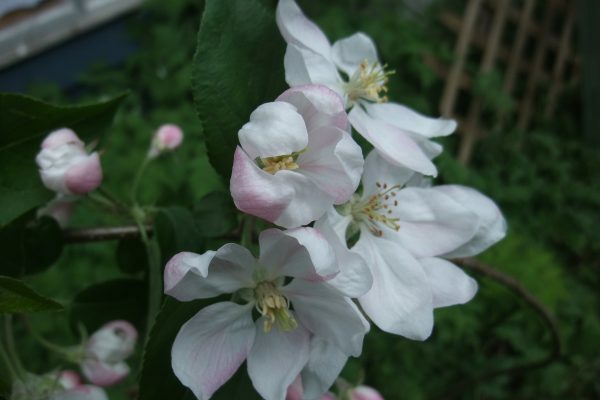 On my travels through the garden, I pass by a space underneath my back verandah. This area is not in direct sun and is protected from the rain. Temperatures are about the same as shady areas in the garden. The reason I am going on about this space is that every year I use this space to store my mason bee homes with nests. This space is out of the way, and is not used for anything else. So the bees inside their cocoons remain save and sound until the fall. It is important to keep the nests in a not too hot and not too cold area. 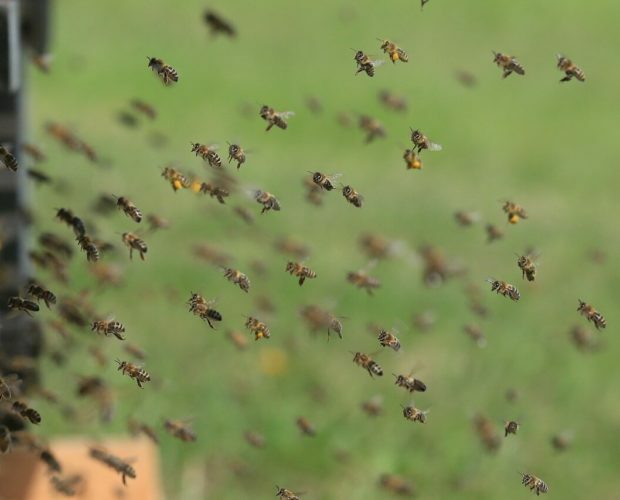 Too hot, and the bees will be warm and use up all their winter and next spring’s fat reserve. 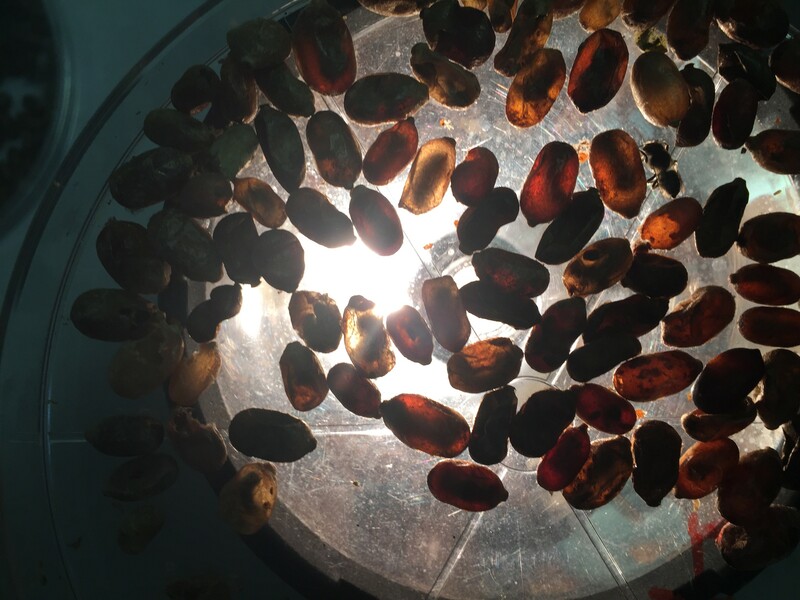 The result in this case is that the bees do not have the energy to eat their way out of the cocoons. Too cold, and bees do not develop into their adult form inside a cocoon. The timing for moving nests into a cooler place, under cover and inside wasp proof net bags is by late June, when bee flight has ceased. I take down all the bee homes and set them, 2 or 3 of them, inside a wasp-proof net bag. I find that by doing this, the level of parasitism is quite low. I remove the bee homes out of the net bags in October when I harvest and clean the nesting trays and the cocoons in readiness for next spring. 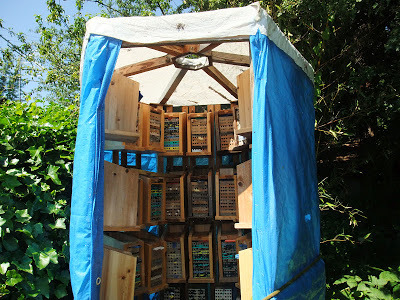 Another way of storing mason bee homes with filled nests is inside a shed that has a window. The window is an important part of how it works. and in this case, it is not necessary to place filled nests into a wasp proof bag. The window works like this. When the little parasitic wasps mature, they emerge from infested cocoons and go to the window. They die at the window trying to get out and do not seem to attack and parasitize more cocoons. Either system of management takes care of these pesky little wasps that can devastate your bees. 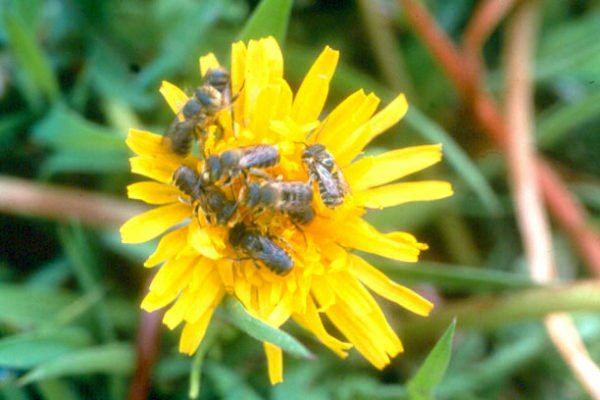 One of the reasons why these pesky little wasps can be so devastating is that once spring comes around and warm temperatures arrive in spring, they can reproduce every 3 weeks or so until late September. If one wasp lays 10 eggs, and these lay 10 eggs…… no wonder they can devastate your cocoon crop! Mice like eating bee larvae!! Other pesky pests are mice. 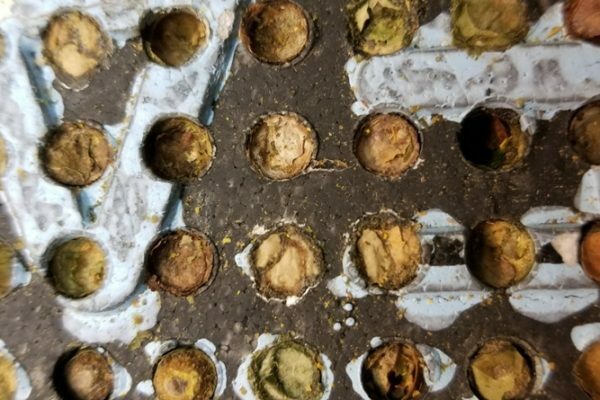 Mice do not damage nesting trays whether made of wood or corn material. 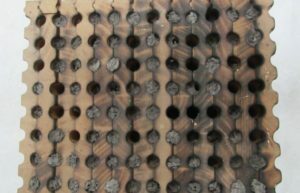 But nesting tubes made of cardboard are fair game from mice and other rodents. Mice listen to the sound of the developing bee larva feeding on their pollen and nectar lump. When they locate a larva, the mouse chews only to get access to the cocoons. It makes quite a pattern, but how it devastates your cocoons. If you are using cardboard tubes, place nesting cardboard tubes in a secure metal box so mice cannot get at your cocoons before harvest time. 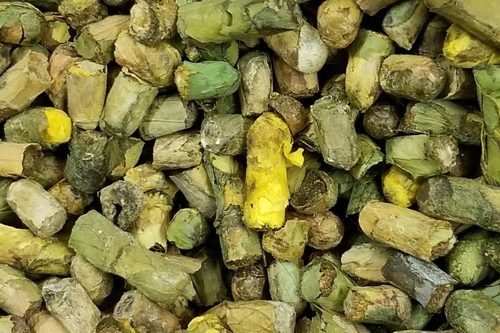 Keep your cocoons save and your pollination will be even better next spring. If the number of bee cocoons are not quite enough for next years spring pollination, let us know. 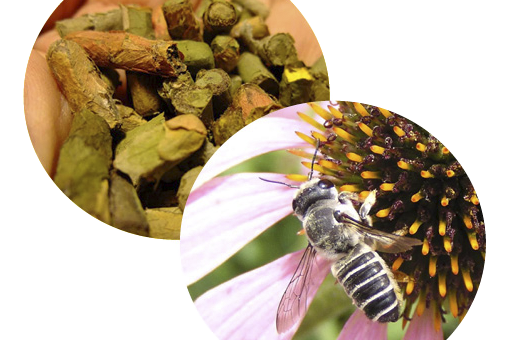 Summer is here-what to do to keep your mason bees safe. 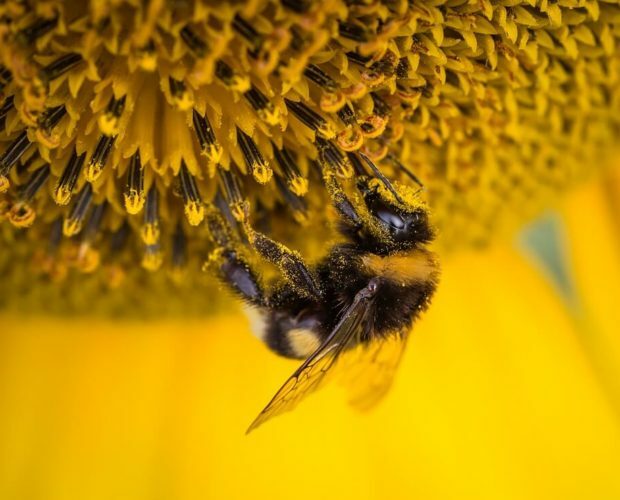 Bee management is all about keeping your bees safe and healthy. 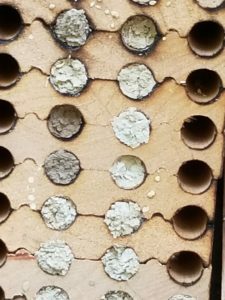 At this time of year, late June, most mason bees have stopped flying and nesting trays need to be stored in a wasp-proof bag or in an outbuilding. 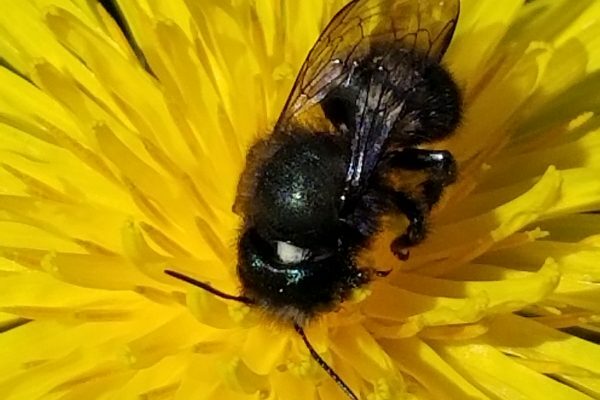 In late June, most mason bees are at their end. They have either died in the field or have died inside one of the nesting tunnels. 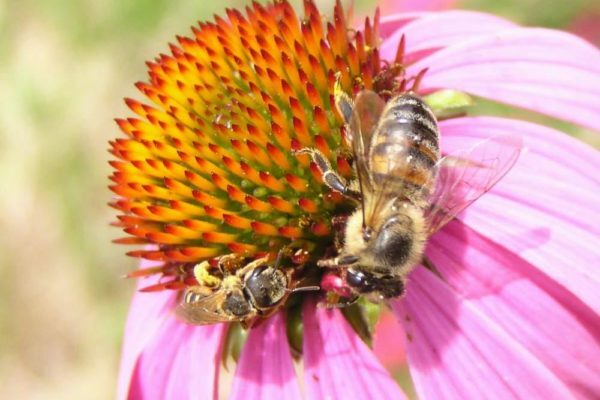 In the spring, bees emerged, collected pollen and nectar for their offspring, collected mud to prepare their nests and laid eggs. 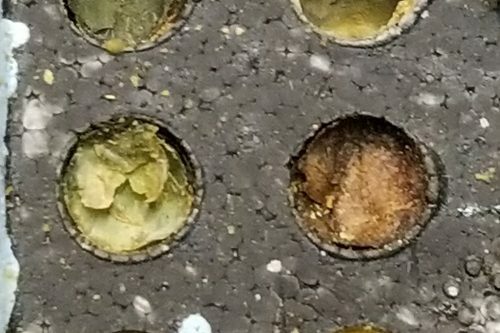 These eggs ate the provisions of pollen and nectar left behind by their female mason bee. Pollen provisions for young bee placed between mud plugs. Then, after they had eaten all their provisions, each bee grub or larvae turned into a bee pupae. This is a resting phase so that their bodies are ready for the next step. The next step is where each bee pupae turns into an adult bee inside a cocoon. All these steps are completed inside the nesting tunnels but only if temperatures are relatively warm- about 20-30C/ 70-90F. It is summer time when mud plugs are visible. 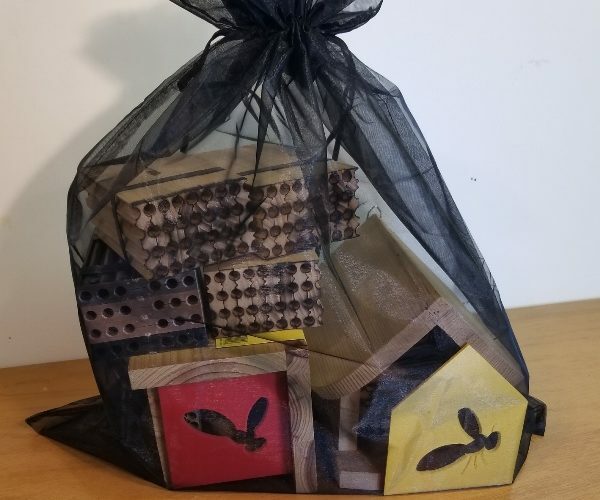 When you notice that mason bees have stopped flying- around mid June, it is time to store them while they develop into adults during warm temperatures of the summer months. 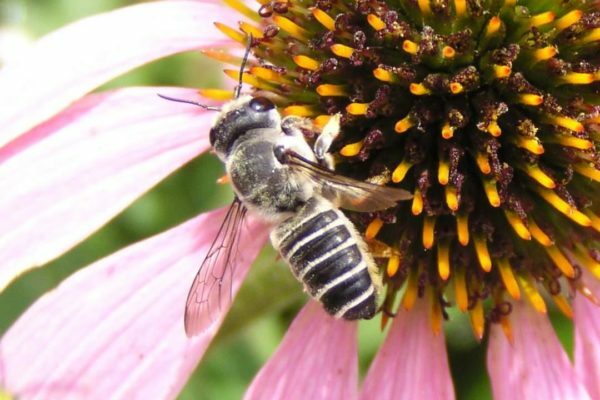 Of course, you may think all bees have done their job, but you might be surprised that there are still some mason bees about that are still producing offspring. If this is the case, come back and check in another week or so. 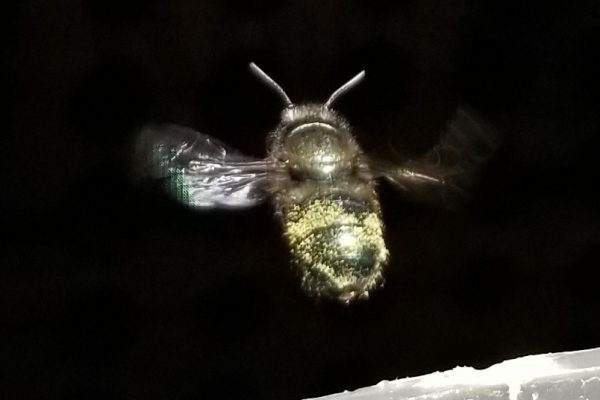 Don’t store nests until all mason bees have stopped flying. 1) The best location to store nesting trays with developing bees is in an outbuilding with a window. Again temperatures should be between 20-30C. Of course more than 30C would be a bit high. The advantage of the window is that when the tiny parasitic wasps emerge from the parasitized cocoons they go to the light at the window and no longer parasitize additional cocoons. 2) If there are no out buildings available, I usually take nests down and place them under a verandah where it is nice and dry, but still warm. 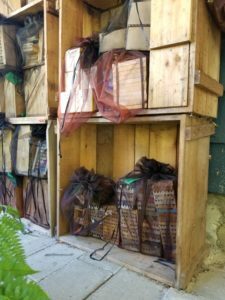 Under these storage conditions, you need net bags for your nesting trays to prevent wasp parasitism and additional re-infestations by the parasitic wasps. Procedure for placing nesting trays into storage: -Remove nesting trays from housing. -Do not drop nesting trays. -Do not turn nesting trays upside down. 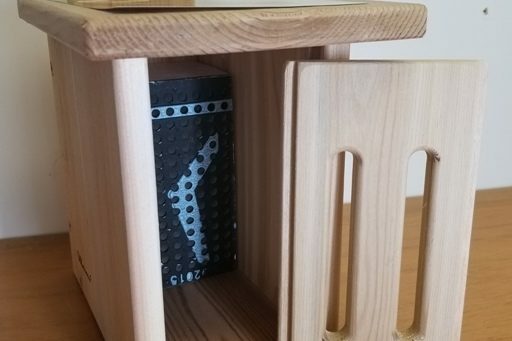 -Keep nesting trays as a unit. -Do not open nesting trays by removing tape. -Gently take nesting trays to the storage site until harvest in October. -If storage site is in an open area and not inside a building place nesting trays into a Wasp proof bag. 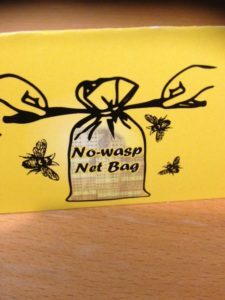 Keep your bees safe with a Wasp-proof bag. A bonus- it is on special. Hi Margriet – last year I had almost all of my 20 tubes compromised and broken into by some critter/bird, etc. I did not have any wire mesh on my two houses. 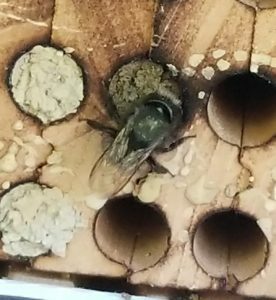 This year I installed mesh on my houses and had 15 tubes mudded by the Mason Bee(s). Another two were mudded up by a Mason bee Wasp which I observed. 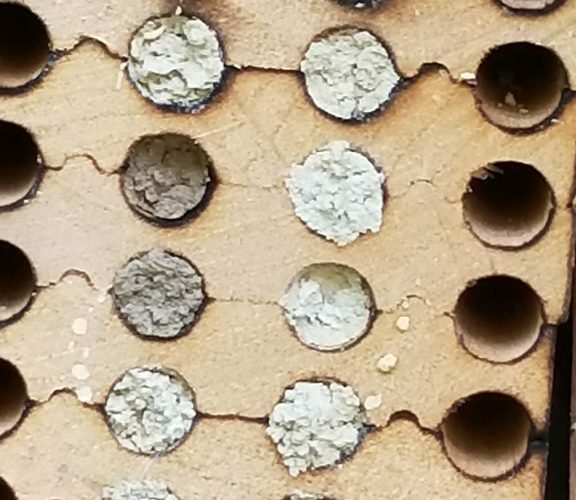 After a few weeks, the Mason Bee Wasp tubes had Holes in the opening. 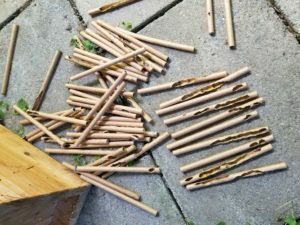 The Mason Bee tubes were OK all summer. Recently, I went up to Princeton for a week and prior to going up, the tubes were doing just fine (Sept. 22). However, upon returning, several of the tubes had been compromised. In spite of the mesh being in place, I am perturbed as to why this is happening. My brother-in-law who lives in Maple Ridge who I gave several cocoons to, says his tubes are all fine to date. Can you shed any light as to why this might be happening. I was waiting till into October to harvest the cocoons and quite disappointed at this event. Thank you Andy. PS a note from Andy in the fall. 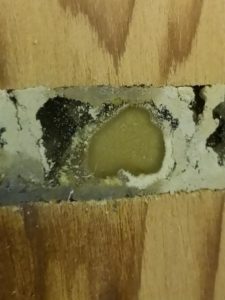 I did have ¼ inch mesh once, but saw that the bees were having trouble getting through – with all kinds of antics, falling once through the mesh, and then having trouble getting to the tubes which were about 3 inches away. The mesh surrounded the top, sides and bottom. I did switch to ½ inch mesh which made it much easier for the bees to land on the mesh then fly to their respective tubes. I did consider mice, and did put some warfarin bait for them, but the bait was not touched, and there was no tell-tale signs of any droppings. Hello Andy, After spring and nesting is over, developing mason bees are a great source of food for all kinds of critters. 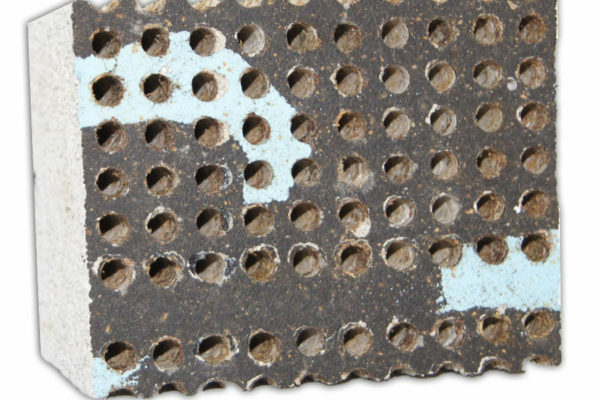 After spring, wire mesh works for rodents but does not prevent scavengers such as tiny beetles from entering and eating tube contents (wire mesh during flight interferes with the mason bees nesting and decreases occupancy of nests). Candling and how to do it. Candling. 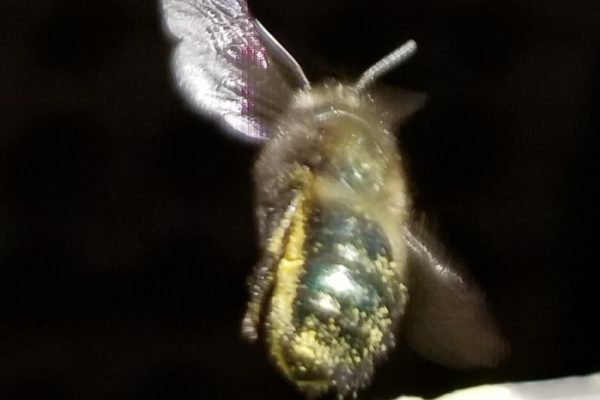 If lots of light shines through the cocoon, there is no mason bee inside the cocoon. Four adult parasitic wasps inside this cocoon. Search and destroy, or wasps will destroy your bees. This candling video shows the technique of candling. Set up a 6V flashlight in a dark room. 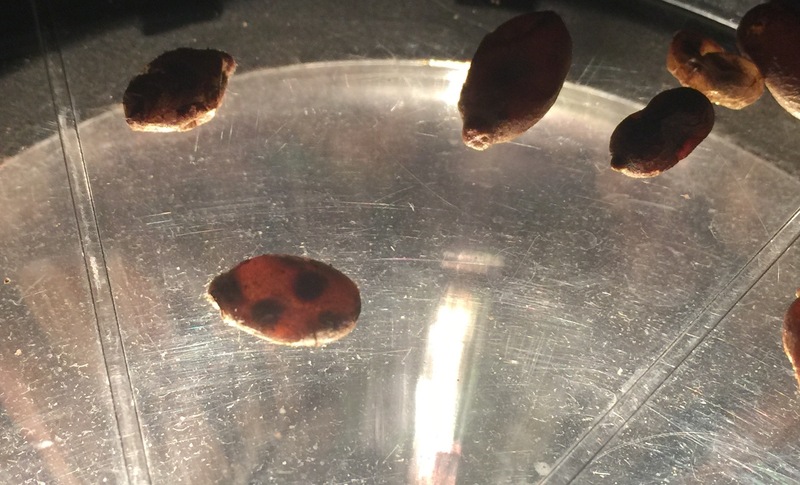 Place washed and cleaned cocoons in a petri dish. 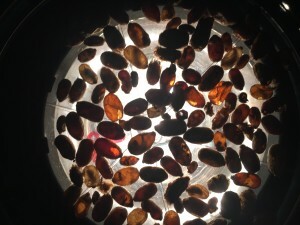 Rotate petri dish over light to more clearly see what is inside cocoons. 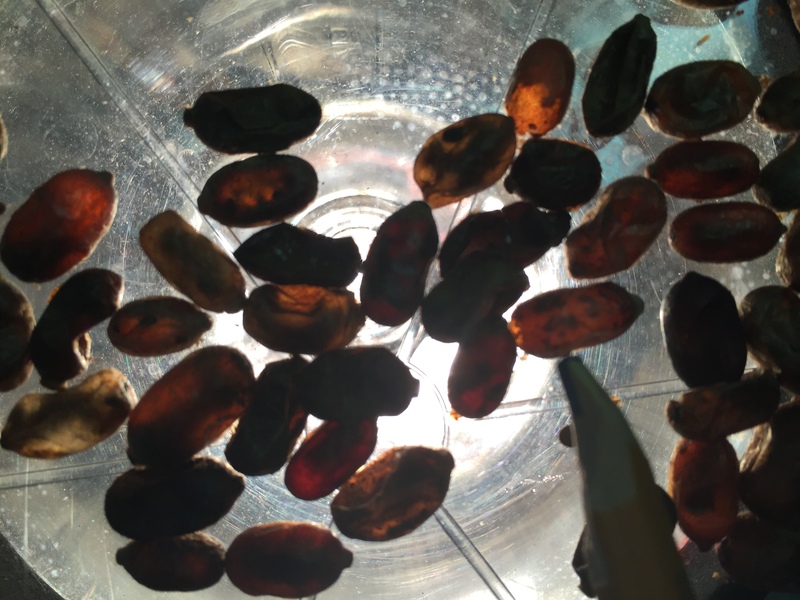 Remove parasitized cocoons. Go to shop beediverse on this web site to order petri dishes. 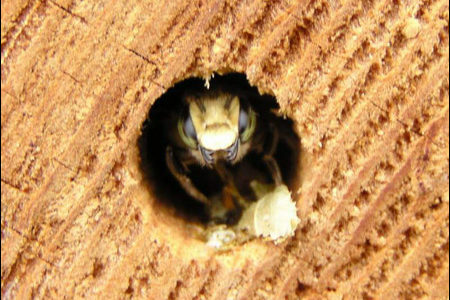 Adult bees while hibernating through the winter in their cocoons, are curled up leaving a small area through which light can pass. 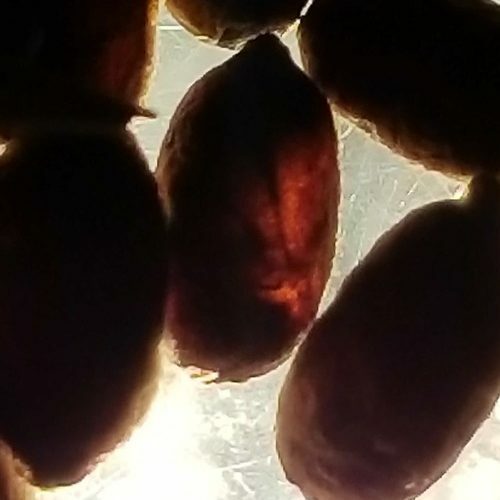 These cocoons appear mostly black with a bit of light passing through the center of the cocoon. A cylindrical area in the centre of the cocoon is often an underdeveloped bee that died during development. 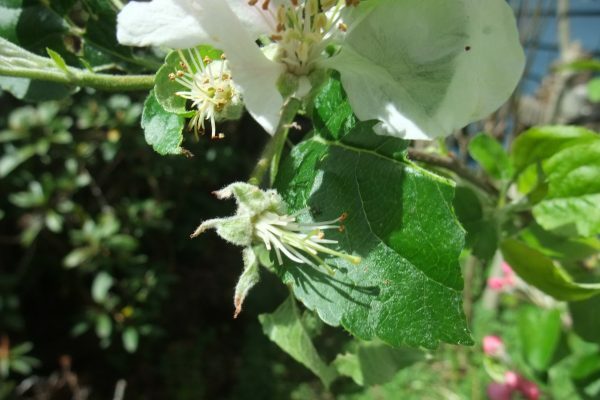 Early July- Time to protect Nests from parasitic wasps? It July 8/12. 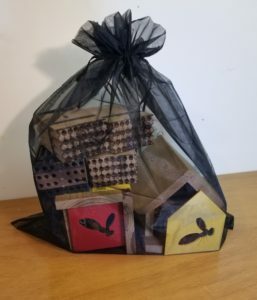 Is it too early to put a cloth bag over mason bee boxes to keep out predators? Yes it is time, BUT some bees may still be flying! I just visited 2 sites today and in both yurt field structures, bees were still flying in and out of their nests. Tomorrow, I will go back to these two sites, and remove all the release shelters- to avoid additional parasitic wasps that might still need to emerge. 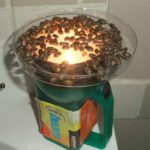 I will also bring a battery powered bug killer- like a small tennis racket with an electric battery driven electric zapper. This should get rid of most of the active parasitic wasps. In another 2 weeks, I will check again, and all, if not most mason bees will have quit by then. At this time I will place a net bag around each nest to prevent parasitization by the little wasps. This is my yurt field structure in Bellingham WA. It is fully laden with highrises and a lot of the tunnel are filled by mason bees. Today we removed all the release shelters. Quite a few bees were flying in and out of the nests…more in a subsequent blog. 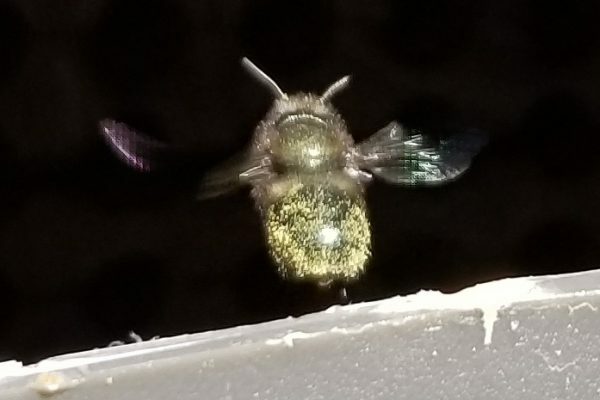 Parasitic wasps of Mason Bees? 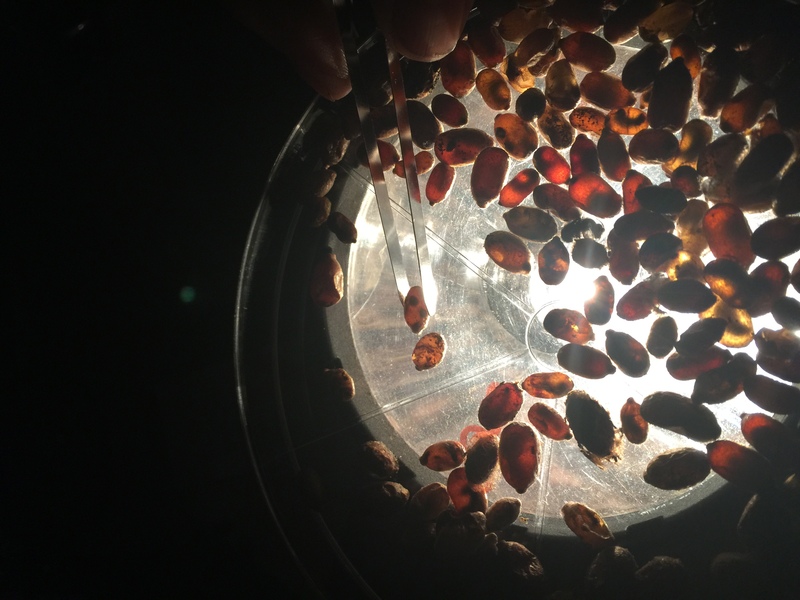 When I have large numbers of cocoons, I often use trays. There are about 2000 cocoons on this tray. One tray is turned over to act as a lid. 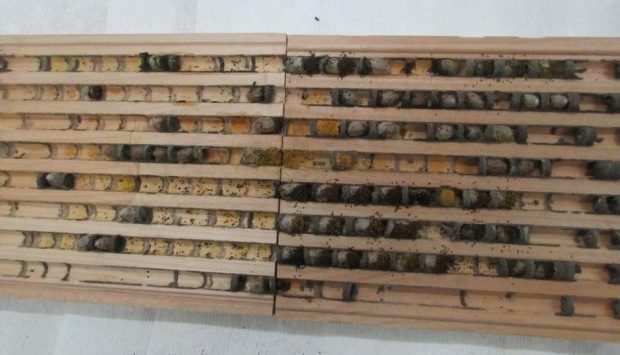 Trays are offset by 1/4″ so that emerged bees can exit. Duct tape or strong rubber bands are used to keep trays in position. Using 1×1 sticks and set between a couple of highrises, a structure is created to hold trays at the upper level of the yurt, but not under the center hole of the roof. Two trays are held in place with duct tape. Two trays offset to create a 1/4″ gap. A comment on this blog asked for more pictures on candling cocoons. 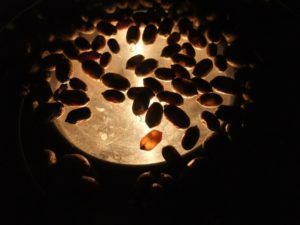 Just today I candled 4000 cocoons. It seems like an awful lot, but when they are in petri dishes it is easy to do candle them- about 30 mins or so. I did see some duds that are of some interest. I call anything that is not a fully developed bee a ‘dud’. The percent ‘duds’ in this batch was 2.5%. Anything under 5% is excellent. But even with 107 duds there are some interesting ones. Few had fully developed parasitic wasps- ready to emerge in spring. 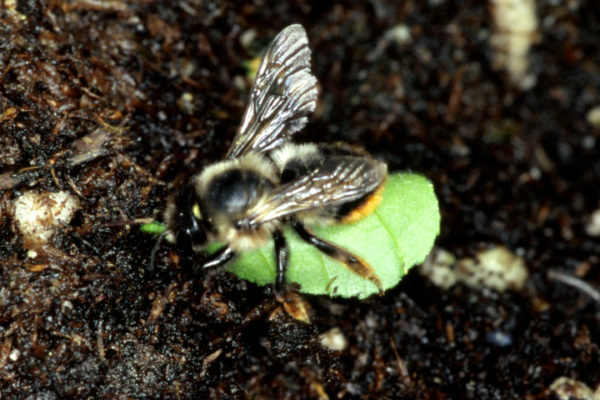 Others were bee larvae that had not completed development into an adult. In the next day or so I will take some photos and put them on this blog. I was teaching a group of people about candling the other day. It is a straight forward procedure but the conditions have to be right. The room that you do the candling in has to be completely dark- a bathroom without a window for example. 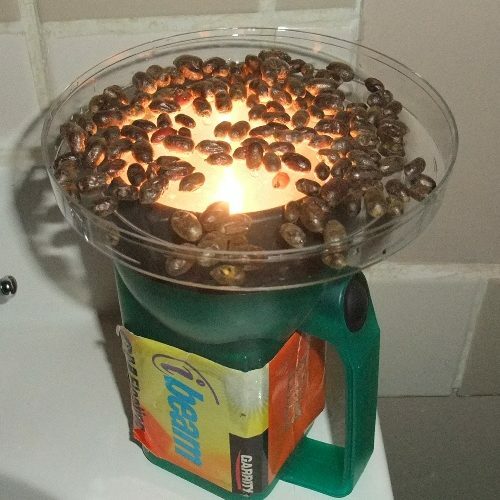 Any extra light besides the flashlight is too much light and you cannot candle the cocoons.